You'll love wearing this plus size women's munchkin costume for Halloween! The costume features a 100% polyester dress. The dress is green with purple trim around the bottom of the skirt. A purple collar with green trim circles the neck while a zipper closes the dress in back. The attached purple apron ties behind the waist and is accented with green trim on the bottom. The long sleeves are green with purple ribbon accents leading down to the purple bottom half of the sleeves. Also included is the purple and green felt hat, which has a flower petal-like brim. 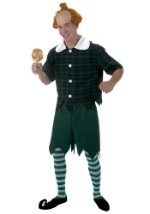 Be sure to check out our other Wizard of Oz costumes for a fun group costume idea!